As a person who has worked more from home than in an office his entire life, built a high growth, and now smaller agency, that was all remote, I likely let others get the fame, glory and credit as being an expert, pundit, or consultant on the idea of remote working. Having traveled extensively, and literally being someone who every day was WorkingAnywhere, this is a subject area I'm still passionate about, and now over the next few months will put to the test as I begin a phase of being super virtual, mobile and still connected. Join me on that journey.... Wine, Travel. Technology and more all there, here and here. When it comes to co-working spaces WeWork is the elephant in the room. They are the giant. The monster. The leader far and away. About the only organization that can compare, albeit with a different goal and model, is Regus, perhaps the first mover in the world of co-working. But both have gaps in their location maps, which in turn presents opportunity for others to fill the gaps. Over the past few weeks as I've been leading a nomadic life of sorts, I've realized that both co-working companies lack any type of affiliate model, so while I have memberships with both, it's often been my discovery that their isn't a location for miles and miles, sometimes even no location at all in some states in the case of WeWork. Unlike the gym and workout world that developed an affiliate membership model early on, in the case of the two giants, its all or nothing. But the digital nomad isn't going to always end up where WeWork or Regus are located, which is why models like those from Croissant , the League of Extraordinary Co-working Spaces (Lexco) and CoPass all are ahead of the game. They function much like traveler lounge leader Priority Pass does, where you join the "club" and get access to all the rest, sometimes free and sometimes for a daily rate. Now here's a thought. If I was running the Centurion Lounge Program for AMEX, I'd quickly work out deals with Regus, WeWork and CoPass, and extend mutually beneficial access rights (as long as the member has an AMEX card) and immediately expand the footprint of the Centurion Lounges. Co-working facilities need an affiliate model...no one company can be everywhere, and given how the concept is past taking off, it's time to go beyond land and expand, and simply give members one more reason to stay members. When Starbucks first arrived on the scene I’ll admit I was a bit late to the party. When it came to coffee I was more of an after a meal coffee person, not a coffee addict. In reality, it was Wi-Fi that got me hooked on Starbucks. I would spend time locating the Wi-Fi locations that in their day were powered by T-Mobile and take the tiniest of laptops I had, and even some Wi-Fi enabled phones, and do all I could to work from a Starbucks. And now that T-Mo and Sprint are merging, Wi-Fi installed in all of their locations would have made Starbucks even more essential to the Anywhere Worker. But I digress. Starbucks to me has always been the McDonalds of coffee. They nailed the concept of consistency early on, giving customers a uniform experience all over the nation, and now around the world. Even more so, Starbucks has really grasped the concept of being the place people meet. It can be for a catch up, for a first date, for a short, informal business meeting or even where students of all ages meet and gather to work together. While Regus and WeWork may be the “co-working” hubs of many, Starbucks, like libraries has been the co-working spot of choice of so many for so, so long. Like McDonalds, Starbucks has embraced the concept of the drive through. Over the past week, I have sat inside many a Starbucks as I have gone on the road, taking my restored sports car for a spin….a long one at that, and as I have watched first hand, the drive throughs are Starbucks boldest and best move yet. While the mobile app lets you order and pick up, the drive through phenomena is really interesting. Just as when Starbucks first went with Wi-Fi, they’re still learning. The number of staff focused on mobile often leaves the inside the coffee shop line waiting to place their order or receive it in many high volume traffic locations. So, while the drive through is high on convenience, it’s often low on speed, especially if you use the Starbucks app while heading to your favorite location. Yes, you can order on your mobile, time your arrival, and be sitting in line while someone ahead of you orders their fresh milk, double shot, mocha, cappuccino, extra foam, cinnamon and extra something, while all you ordered was a double shot espresso and a bagel. McDonalds this past year solved the long wait vs. short delivery time and regular drive through order, with a waiting area for those who have more challenging, larger or more complicated orders. As a child I would go to the library often with my dad. Back then, the library was like being in a house of worship. Silence was the golden rule. Sure there were a few places where people could talk but those were few and far between. That said, when I was in high school, the Northeast Regional Library was where high school class groups would usually meet up to work on projects together. Little did I realize I was co-working in the 70s in a co-working space. Fast forward to today, the public library may be the lowest cost co-working place around. I grew up in Philadelphia and was a regular guest of many friends who were members of The Union League, Racquet Club, Rittenhouse Club and The Locust Club back in the 70's and 80s. Back then, the Union League was THE power broker club and was "Men Only" until the mid 80's just like the famed New York Athletic Club that back in 1989 broke the sexism barrier and allowed women in. When I read about "Women Only" co-working spaces in Time I first thought back to how hard women fought to gain entry to Men Only clubs like those. There was an outdated (and by then outdated) reasons why the "Clubs" kept women out at first, but times and women changed. As more women had entered the workforce and were in leadership positions their being denied entry, curtailed them from the opportunities and dealmaking that was going on the "clubs." But the more I thought about it, the more I like the idea of women only clubs even if it walks back on what women wanted in the prior generations. With all the upsetting news about sexual harassment and gender bias in today's society (and it isn't going away), giving a woman a place to feel safe, work without the wandering eye or groping hands of men is really good for them. They need sanctuary, much like the men did in their clubs away from the women. The clubs are about business. Not the search for Mr. or Ms. Right Now. At the same time, it won't be a surprise to me if we see a rise and return of the men only, so called power clubs, like I grew up having lunches at with friends who were members (I was never a member though was asked a few times to join them,) as there can't be a double standard. That's because clubs and private membership groups can only be one of two things. Inclusive or Exclusive, but not both. Grind TV has a nice summary about the Roam Co-working and co-living operation that currently have three properties up and running in Madrid, Miami and Bali. The company, which is promising more locations in the near future, has raised over $3 million dollars to fuel property acquisition and growth around the globe. Far more than a hostel or hotel, Roam is creating workspace/livespace communities for the digital nomadic community at relatively modest prices. Given the locations, $500 a week or $1800 a month for a private room and all the co-working facilities is fairly reasonable, especially given the promise of blazing fast, business grade Wi-Fi and Internet connectivity, and a full-time on site manager. The winds of change in work, travel and residential living are here now, and properties like Roam and WeLive from WeWork are going to become the next phase in work, life, reside. It's only a matter of time and place. Business Travel New is reporting that IAG, the group that owns and operates British Air, Aer Lingus, Iberia and Vueling will start to roll out Wi-Fi on Airbus 321s and 320 starting in 2017. My travel the last few years in Europe has been rather frequent, and I've always been amazed at the lack of Wi-Fi on planes other than on Norwegian Airlines and the occasional plane that was really a long haul piece of equipment. The big reason was always the short duration of the flights and the cost to retrofit so many planes. But with more new satellite technology coming on board, and with smaller, lighter and more efficient on board the plane technology, the interest has finally blossomed. With this type of news, one has to wonder just how soon the Asian airlines add Wi-Fi with regard to short haul travel. Dialpad had Altimeter Group's Brian Solis author a report on the "Anytime Worker" who is "working anywhere" they can these days. With coworking spots the rage all over the world, and more remote working going on all the time, the report is rather timely. Sign up here to get your copy...and read away...Anywhere you want to. We've all become so used to hotel WiFi being there, that when it's not we might go bonkers. But that doesn't always have to happen. At least not when you bring your own broadband.....I'm telling you this because this morning I woke up here in Seattle at the Coutryard by Marriott and the WiFi was connecting, but there wasn't any IP connectivity. I was too tired to care, didn't feel like being the IT guy for the hotel because thankfully I packed my AT&T LTE pocketspot! A few hours later, it's all back working. Someone must have called and gotten it fixed, but in the meantime, I wasn't disconnected. Besides, it's Saturday and time to go out and smell the coffee. Working on the road often means room service. Sometime, working on the road has you staying in extended stay hotels like Homewood Suites by Hilton or Staybridge by IHG. Those offer small kitchens but shopping for food isn't always convenient. Thankfully, today we have options that solve both the "I'm hungry now" and "I need some food in the fridge" for many of us. For the hungry now crowd, there are now new services like GrubHub, Delivery.com and Doorstep Delivery, all of whom make it easy to have hot, or cold food, salads and beverages delivered usually within an hour. For those who feel the need food to cook, or simply need things like shaving cream, mouthwash, toothpaste, deodorant, soaps and more, there's now Amazon Fresh in more cities. With Amazon Fresh you can order what you need, in advance or even in some cases, same day, and have it waiting for you. Just make sure there's a way to receive it, where you are staying as some AirBnB or VRBO locations may pose challenges for delivery. Options on the road for the road warrior are changing, and getting better for us. All it takes is a little knowledged and some planning. The web site Future Travel Experience gives us a good look at what may be possible for our air travel, from check in to exiting the airport, exposing what we will be seeing and feeling. Much of this "experience" derives from design, which is all about setting up the "user experience" that we desire. Unfortunately, often the experience falls short due to poor implementation or skipping steps that are important to the passenger, or adding layers to the experience that either complicates or inconveniences us all. As someone who regularly has taken the EuroStar and the Heathrow Express in France and the UK, as well as being a regular Amtrak passenger here in the USA, it's great to see how design is being thought of by the railroads. The Eurostar has always been at the forefront of a good travel experience once you get on the train, but after you check in, the experience is never smooth, as it feels more like a cattle call than a leisurely entry to the train. In the railway car, you'll find in seat power with both EU and UK outlets varying by seat, comfortable seats that recline with ample leg room, non-obtrusive service and for the most part, a quiet journey. Now, ten years later, the experience is being upgraded and design is at the heart of it. I'll be the first to admit that I've lost my love of brand loyalty programs. You know, the ones like American Airlines Advantage that pretty much kicked it all off. Well now, American and Southwest in the past two days have both offered to boost my status by my buying my loyalty level. To me this is a number game, not a loyalty game. If the airlines offered me things like no cost redposit of my scheduled flights that I had to change, the ability to do name changes for business tickets (we do change people in companies sometimes), no hassle booking for seats that are available on all flights using points/miles, a resumption of seats that are not so squeezed together where you can't work in coach I might think about the program's value. So, rather than pay for what are perceived benefits, I'd rather simply use the pay as you go approach, and put my money into paying for a better seat, than hopefully earning a better seat because if I'm being offered the move up to the next level, you have to realize those above me are being offered even more. Marriott wants your business. Directly. And to get it they're offering free Wi-Fi to lure you, like a fish. The catch? You have to book via their website, using the mobile app, the call center or the property directly. But, if you're a business traveler, who has a corporate travel agency working on your behalf, you better have them negotiate the free Wi-Fi option or you'll find yourself paying. This is in Marriott's mind, about loyalty programs, or in their case, Marriott Rewards. For the business traveler who has racked up thousand of miles, nights and bonuses, turning in a bill for Wi-Fi is sometimes aggravating, especially when the promotion about "free" Wi-Fi has attracted so much attention will cause grief. This means that corporate travel buyer has choices. They can negotiate the rate directly with Marriott, or they can work with a Corporate Travel agency, but what's clear is Marriott is working to leverage their loyalty program, and put the power back into the hands of the traveler to let them do their own booking. The way this can be done is with the business traveler using the rate code vs. booking it through the travel agency. The rate code insures the negotiated rate is applied, but there's no comission back to the agency. For agencies, they need to work on a fee basis, vs. the commission basis. That means negotiating for their clients vs. buying for their clients. They have to manage, not just sell. For in house travel departments this isn't a problem. The travel manager can establish a direct relationship with Marriott vs. going through their agency. For the agencies, they see this as one more effort by the travel industry to catch up and flatten the business model, squeezing out more profits vs. paying commissions. 1. If you're a one time only guest, don't bother. Use your status and ask for as much as you can get in perks. 2. If you're a guest who will be regularly staying at a property, take the time to meet the hotel GM, Rooms Manager. When you know you're returning, given them a heads up as soon as you make your reservation, or better yet, let them book it directly. 3. When you are on property, ask to meet them for a coffee or a drink. Spend time, let them know what's going right, and wrong with your stay. Share other hotel experiences, both good and bad. 4. Become their favorite guest. As you visit other cities and if you stay in the same brand or family of brands properties ask them to give their peer a heads up for you, and let them share what you like, and don't like. The idea is to get you treated as well in the one time property the same way you do in your home away from home. 5. Be nice and be helpful. If you have some way of returning the favor do it. If you learn of someone's birthday, send them a note, or a small gift. By taking care of the people who take care of you, you'll win. The key to all this is about what I call property loyalty. It goes well beyond brand loyalty because people in the hotel industry move around, and as they move around, you're reach and benefits of personal relationships will benefit you, and your business. I realized over the weekend that I've been silent too long on the subject of working anywhere, something I pioneered pretty much at the age of 14 when I was pulled into the world of sports, sports marketing, public relations, game and event operations and more. So I guess, now 40 years later it's time to put all that I've been learning to practical use. For starters, people work in more places today than ever before. Working from Home (WFH) isn't the abnormal for many. Working On the Road isn't just reserved for truckers and field force technicians. Being at the clients offices is no longer just for a meeting. Doctors, once those who made house calls but who became restricted to offices by draconian insurance industry regulations now use mobile devices, video and more to evaluate their patients and keep office time for those who need it. As someone who has closed deals in bed, worked from the beach, on snow covered mountain peaks, on planes, trains and automobiles, in restaurants, on ferry boats and yes, in the doctor's office too, I'm not shy about working wherever I may be. As a frequent business traveler, one who logged on average more than 200 days a year on the road the past three or four years, the idea of working anywhere is as second nature as brushing one's teeth. Our world has changed, and as someone who has been using a cellular/mobile phone for what feels like 30 years, and who has had his own phone for 40 plus years, one can only look ahead at what being mobile has done for us. For starters its created freedom for many. No longer bound to desks, offices and meeting rooms, we are now working in many more places. Once thought to be only for sweatshops, the idea of a giant communal workspace is being fueled by the fact that people talk less but use text more. This has given rise to IM, SMS, third party apps, services like HipChat, Slack and more. Connectivity via the Internet, both wired and wireless at speeds that are over 1000 times faster than my first 300 baud modem are just around the corner for many of us. Video conferencing, once only ready for the boardroom is now available to just about anyone using any number of services. Conference calling, once the bane of group participation is now sounding better as HD Voice is part of some services like GoToMeeting, ZipDX and Voxeet. VoIP, once taboo compared to circuit switched telephony is now so widely deployed it's begging for the major telephone providers to all work together to insure seamless, high quality audio, rapid connection times, and more services as part of you plan vs. third parties who provide just that. The devices and "things" we take with us are also getting better. My keys are tracked by my iPhone as is my wallet and billfold. Leave my iPad in a cab or shopping cart? I'll find it and have it back in thirty minutes or less. Devices like TrackR and TILE are always telling me where my THINGS are so as I get older, forgetful (or is that mind too busy) I can locate them quickly, send a signal to them, or in the case of a lost smartphone or tablet, wipe them out and not worry about what's on them. When it comes to travel, our boarding passes and reservations are now electronic. This makes changing flights and hotels faster. Why we can't pay less is because the yield management tools are geared to getting everything lined up as far in advance as possible, and hotels, trains and planes operators have not yet mastered just in time travel the way McDonalds has nailed down their supply and staffing systems. Toss in security and the layers of what's possible just isn't there yet. The hotel concierge, once the expert on dinner, theatre, shopping and sights to see are having their roles changed to. Today they need to know as much about Uber, TaskRabbit, Fiverr, Washio and other on demand services. Local on demand services is where the hotel concierge used to excel, but as online has replaced the phone book, and as Uber has replaced the cab, you can order just about anything overnight, and now with GrubHub, Delivery.com, Doorstep Delivery and other "local" services, what the guest's needs from the concierge and doormen has changed. So too has the technology in our rooms. Televisions of old never let you plug in, but now an Apple TV or Google Chromecast can make you in room TV an in room extension of your Mac, PC, smartphone or tablet. This means your room is now your office on the go, and instead of having to go hunt down a Starbucks in hopes of a "work place" or venture out to a Regus location, you can work in silence in your sweatsuit, getting things done. Technology now tells the hotel chambermaid if you're in, or out, so no more knocks on the door when you're in deep thought, or on that important call. I'm up in Los Angeles so I brought along my Sprint Overdrive and saw I needed to update the firmware/software on it. Now when I look at the top it shows I'm on a "Partner Network" which I never saw before. I guess what they're doing is distancing themselves from Clearwire, whose network it seems to be riding on. And I guess that means we're seeing the start of true data roaming in the 4G space. Maybe one day we can all have only one device. One plan and not have to worry if the network is GSM, HSPA, HSDPA, HSPA+, CDMA, WiMAX, LTE or carrier pigeon. It seems in Germany some of the ICE trains also have WiFi too. 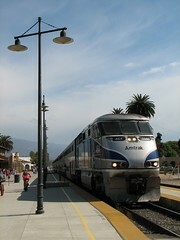 Just like the Acela's on the east coast here in the USA and a few of the Pacific Surfliner trains that run along the California coast between San Diego and Santa Barbara. Having used these in the past, including the Heathrow Express, it's nice to see the railways of the world recognizing that getting work done on a train is no longer just an amenity. A new survey out today out from Skype shows that the popularity of remote working – or “teleworking” – is on the rise, and it's being fueled by the advent of new technologies we're all using and the perceived benefits that employers are seeing, including higher productivity and employee retention. That makes Skype the new switchboard, according to The NextWeb...and the claim, even with last weeks outage, and despite the pathetic Mac client, likely correct. As someone who runs an all virtual business, and have since 1992, I can attest to the sentiment the research is showing. As far back as the 1970's when I worked for the Philadelphia Flyers, part of my "work hours" were either performed from my parents house (I was only a teenager) or from various places, usually payphones or professors offices when I was attending Temple University. Back then my "telework" consisting at first of nothing more than a pad, pen and remote access to my "answering machine. We sure have come a long way in the past thirty years. Skype's survey, which was conducted by Incites Research in Q4 2010 surveyed 1,000 professionals in the U.S., across small, medium, and large size businesses. What the survey revealed was that today’s workplace is "undergoing a shift" and the new “Living Workplace” is emerging. o 62% of firms now allow remote workers. o 71% reported that flexible remote working helps businesses to attract potential employees. o 67% of those surveyed said offering flexible working helps businesses to retain effective workers. o New communications technologies, such as video, are making communication more productive and collaborative away from the office. Of the workers who use video, 68% reported experiencing richer and more productive communication with colleagues, clients and suppliers. o Email and landline phone usage is expected to decline, while social media, IM/chat, texting and other newer technologies are on the rise. o The communications tool that is expected to have the biggest gain in usage next year is video calling. o The adoption of new technologies in the workplace hasn’t happened as a matter of policy or top-down control. It’s happening due to the “consumerization of IT,” whereby employees in organizations have adapted their own personal technologies in the workplace. In two thirds (67%) of organizations, workers can bring their own personal technology into the workplace. In my agency we make great use of lots of the technology that the survey references and it really can work. Best of all, it allows me to recruit and keep people who may otherwise not be able to remain on the job, as they want a more flexible work-life balance, and yet, they deliver more than others because they are able to do what they need to do, when they need to do it. Balance is maintained, and the work gets done. I'll admit, that I love to go to Starbucks as my "get away" from the home office office. Meeting are easy to arrange at their locations, as most people in the technology world know where one is. So of late, after returning from my exhaustive 6 week European business trip and mini-vacation, I found my Starbucks card in my USA wallet, not my EU/UK version. And guess what, I've yet to switch back. But after a week of using "cash" I remembered I had the Starbucks Mobile Card app on my iPhone (it also works on the iPad and iPod touch) so between that app, and my drivers license, a headset with mic and an Amex card, who needs more? I mean, you can do just about everything you need to do away from the office on the iPhone, iPod touch or iPad that's work related. I can check email, surf the web, make VoIP and Skype calls over the AT&T WiFI and of course get caffinated to go back to the home office and do more work. With apps like GoToMeeting, Calliflower and WebEx, even virtual meetings are possible in what I've dubbed Conference Room S for many years. So while you can only have the Starbucks Mobile Card active on one iOS device, it does mean my wallets a lot thinner. Digital...if you're not.. Wake up and smell the coffee. This makes me wonder sometime why others like Wal-Mart, BestBuy, Target, Vons and other so called forward thinking retailers haven't gone to the digital bar code app, that ties together the frequent buyer club data, with a digital wallet. Forget the emerging idea of NFC (near field communications) the implementation of the digital bar code by Starbucks inside an iPhone app and it's ties to their loyalty program and balance recharge program is just plain dumb, simple. It works, and it works very well. As a matter of fact between that and the Mobil/Exxon SpeedPass the whole idea of going cashless without a "credit card" seems a lot more personalized. Amtrak is getting it right. After a successful deployment on the Acela trains in the Northeastern USA and up in the Pacific Northwest on the Cascades line, they have decided to add Wi-Fi to 450 rail cars using technology from UK based Nomad Digital. This is a huge plus for the riders of the rails who need to get work done. I travel a lot, and for the past few years the Apple Airport Express has been my favorite travel router, and in some cases it may still be. But for the past few months I've also been totting around a very small and full featured travel router from D-Link. And I love it. The tiny router that fits inside a small case is the D-Link DAP-1350. Why is it so good? For starters it connects quickly to all kinds of wired networks. It comes with everything you need, all in one case, but most of all is it's range and power. I find that after I've gone out of range of the Apple Airport Express, that the smaller, and lighter, D-Link is still going strong. As someone who rarely writes a product review, this is one product that makes a road warriors life easier. You can buy it online at Amazon for under $80 USD. Om's post about the best gadgets of the year got me thinking about how similar we both are and for the most part we agree, 3 out of 4. I don't use SONUS but I do have Apple TV, and the three other gadgets he mentions. 1. A tie-CallVine-the conference calling service that calls you.-Calliflower The most complete conferencing solution--HiDef Conferencing-It just sounds better than all the rest. 2. Boingo-i connect more easily in more places. I actually have begun to wonder why I still have a T-Mobile Hotspot Account but there remains some hotels where they are still only T-Mobile that I stay. 4. Facebook-I have reconnected with more friends who I had lost touch with each year. It's the SOCIAL Network that actually has business benefits. 5. Linked In-It is how to find and manage business relationships. Nothing else comes close. 7. Skype-sure it's got the risks of being free, but the size of the "community" and how good the video is now...it has become an essential, especially with the FreeTalk Everyman Hands Free head set on my iPod touch or iPad. 8. TripIt-I travel 200+ days a year. I rely on this to know where I am, what I'm traveling on, where I'm staying, when I'm eating, etc. I also share the data with my trusted circle. 9. FlightStats and associated apps/services-with weather delays, flight delays a part of life, this helps know your options. 10.FlipBoard-I love to read on my iPad and Flipboard, along with Pulse and TweetMag give me a very personal view of what I need to read. Toss in TechMeme and I have all the news summarization I need. What's amazing here is that most of these are SaaS (software as a service) or CaaS, communications as a service. Sure there's a client for some to access the data but for the most part they are all web apps, and I predict that in 2011 we'll see Skype as a browser app not only a desktop app. That supports the iPad, Mac Book Air and even the Android devices, though my feeling is Android is like VW and Apple is like BMW or Porsche in the way they are made. Both provide reliable transportation, but the latter give you style, performance and turns heads. So do most of these apps and most of all, they make my life easier. Honorable, but very deserved mention--My entire staff at Comunicano. They are the best (at) service a CEO can have and they're totally virtual all the time. TechCrunch is reporting that Google plans to go into the video conferencing space in a big way. Here's why they can do it. 2. Google purchased my former client GIPS this year. GIPS gives the incredible understanding of video codec and video conferencing. It also helps makes them independent of Vidyo at some point in the future. Google previously acquired On2, a video compression technology company. 3. Google acquired Gizmo5 this year too. Everyone forgot that Gizmo had SIP based h.264 video built in. But Google got more than a softclient, they also got a network that could handle video call routing. So, for far less than Skype has ever been bought and sold for, Google has all the makings of a standards based IP video calling business, which can also handle having video (IPTV) run over with some very pristine looking video that can be HD from the get go. Wired.com' s Ryan Singel in Epicenter has a very detailed account of Silicon Valley Wi-Fi hardware provider Ruckus, and how their equipment is changing the wireless landscape. In a nutshell, Singel reports on how the new Ruckus technology makes public space Wi-Fi work and also sheds light on why earlier efforts never did. As someone who has used Wi-Fi on three continents in the last 14 months, and who spends a lot of time on airplanes, in airports and public workspaces, I can see how, as the global mobile workforce expands, that Ruckus' better radiating Wi-Fi radio systems will only make for a better end user experience. At the end of the day, the better the experience, the happier the customer is, and the lower level of customer service issues that arise. While LTE is one of the hot buttons for 2011, especially as we will see come this coming January from Verizon Wireless here in the USA, good old 802.11 is not rolling over and play dead. As a matter of fact, with technology like what Ruckus is putting out it only bolsters what companies like client Boingo, iPass, Aircell with GoGo Inflight, Row 44 and NomadDigital are all doing to keep us all better connected. In the world of eco-system competency, this is only good news for each of them, as the better the experience, the more likely road warriors and the leisure user will have that better experience, resulting in more users and longer sessions wherever the access may be. For the companies that make the connection, it also means more revenues, and likely, lower costs with these new access points. A survey in the UK shows that a lot of Brits will be looking to connect to the net with a mobile device. That's giving rise to the sale of pocketspots, also known as the MiFi. As someone who uses both data dongles and 3G/4G Pocketspots from Novatel Wireless and the Sprint Overdrive made by Sierra Wireless, I can attest to their allure and attractiveness for those on the go, especially those of us who carry multiple devices and have urge, need and desire to be connected all the time, even in places some would never wish to be connected. Samsung and Polycom are linking up to bring HD video conferencing to the Galaxy tablet. This brings a whole new level of face to face communications. If you are into collaboration, then the December 9th Network Conference staged by GigaOm is right up your alley. Pal Surj Patel, who I have known since his eTel days, has once again pulled together a killer line up of speakers and demonstrators, surrounding it all with witty interviewers and panel members. When you see companies like Cisco sending multiple speakers, you know this is a serious conference, and when there's others from the likes on LivePerson, CitrixOnline, Deloitte, Intuit, we're well past the garage and coffee shop crowd that's working in a networked manner, but not in the same place. As someone who runs a distributed workforce based communications company, the knowledge and potential for learning at Network is massive, so if the speakers hit the mark, as they have at past GigaOm events this will be a can't miss event. Well, the best laid plans have been short stopped. It seems that Skype 2.8 for the Mac and the newest, and smallest, Mac Book Airs are not getting along. Beyond the online Skype Developer report, I've experienced it first hand. Apple's support was very receptive, and even while Skype is third party software, the apple Senior Support person was extremely interested, spending almost an hour with me as we gathered all kinds of information from the new Air and an older Air where Skype is working fine, under the exact same version of both the Mac OS and the Skype version. Laptop Magazine highlights the results of a telework study that Microsoft conducted this year (2010) and revels a lot of what I have been doing with my team, and saying, for the past eight years. 1. We get more productivity out of people. 2. The concept is more green. 3. The tools out there are making it easier. 4. Rent of office space stops being an overhead cost. Overall, working from home is not a bad idea. You usually get to pick your own office. You can decide what to wear. You can schedule things around your daily home life, and for those with kids, child care stops being an essential for most. Bottom line, everyone makes more money. I'm all for believing what is in a press release, unless it comes out on April Fools Day, but when two giants in their respective sectors, telecom and hotels, allow a joint press release to be put out, usually that means reality, not fantasy. You see, if I want to read fantasy, I can get all of that from long time author friend Raymond E. Feist, who has penned enough of them to keep any fantasy lover happy. Back in July the two companies issued an announcement about their efforts to improve their in building WiFi and Internet access. Unfortunately my experiences in Hiltons the past few months overall has been fairly consistent. In a less than stellar way. This past week, my company stepped up as a sponsor of the Wireless Health 2010 conference at the Torrey Pines Hilton. Not only was the AT&T coverage for cellular virtually non-existent, but the WiFi and Broadband overall was to say the least, pitiful. As a matter of fact, it was worse than when DEMO used to use the venue five or six years ago. That was pre iPhone, iPad and Android, and well before pretty much everyone attending conferences needed to get online. One would think that hotels owned in part by the brand on the marquee would be the first to jump on board with the fatter pipe and better service. But alas, that wasn't to be. What's worse though as someone who posed the question to Hilton's PR folks, both by phone and via email, where I asked to learn what properties have been "upgraded" has yielded as fast of an answer as their broadband. Over 24 hours later, I'm still waiting.............oh, I guess Hilton's Corporate Internet is supplied by AT&T too, so maybe their PR folks just can't download things fast enough either. But seriously, emails to two different PR managers and a phone call where I was told to whom to ask the question lets me think that speed of broadband isn't all that Hilton needs a speed boost with. 1. How many Hilton properties have now deployed/upgraded to the new AT&T High Speed Internet offering announced this past summer? 2. How do they breakdown by Hilton Brand? 3. Which properties have been upgraded? Sure the release says, "over time" but based on the face to face reaction I got from the property's GM about the need for speed, I doubt his property's time is coming down the pipe any faster.